Bridge column, March 19: How many ducks can fill one deal? Tom Shales, a Pulitzer Prize-winning TV critic, described actor and comedian Robin Williams as "a fellow with the inventiveness of Albert Einstein but with the attention span of Daffy Duck." That would not work well for a bridge player, who often needs to have an attention span lasting the auction and 12 tricks. In this deal, though, "duck" is the key word. How should the play go in three no-trump after West leads the heart queen? 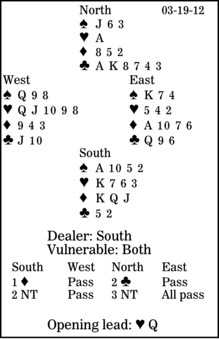 Opening one diamond with three cards in the suit occurs only with the distribution of that South hand. Also, South's two-no-trump rebid is forcing. If North has game-invitational values with a six-card club suit, he should raise to three no-trump, hoping his suit will be useful. This also means that if North rebids three clubs (even using Standard, not two-over-one game-force), that should be forcing. South starts with five top tricks: one spade, two hearts and two clubs. Assuming clubs are 3-2 (if they're 4-1, the contract has no chance), that suit can add three more winners, but declarer also needs one diamond trick. As a consequence, he will lose the lead twice before having his nine winners established. He is in danger of losing one club, one diamond and three hearts. After taking the first trick with dummy's bare ace, South must call for a low club. No doubt West will take the trick and persevere with the heart eight. What now? Declarer must duck this trick, win the third heart (getting East out of the suit if it is 5-3), run the clubs and play a diamond. When East has that ace, the contract makes.